Antonio is interested in the systematics, taxonomy, and behavior of beetles, specifically ground beetles (Coleoptera: Carabidae). 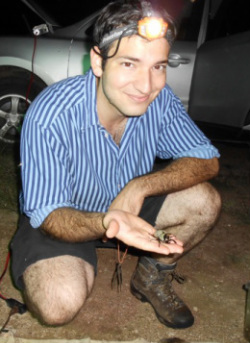 His masters research focused on a group of flightless carabids in the genus Rhadine LeConte that can be found on mountaintops, in mammal burrows, and in caves in North America. This genus is in need of revision, and based on the examination of molecular sequence data from specimens from various mountaintops in Arizona it appears that there may be numerous species in the genus that are new to science. Gómez, R.A., & K.B. Miller. 2013 Prionohydrus, a new genus of Noterini Thomson (Coleoptera: Noteridae) from South America with three new species and its phylogenetic considerations. Annals of the Entomological Society of America, 106(1):1-12.